Hobie's fshing product manager, Morgan Promnitz, anchored up in the Revolution 13 using the handy stakeout pole. Fast forward to the summer of 2011, Las Vegas, the ICAST fshing trade show. 2008. There's a mostly vacant town center, a restaurant that's closed (after three I stumbled onto the Hobie exhibit and locked eyes with the Pro Angler 12 for diferent owners) and some lonely homes scattered about. It's built along a the frst time. It was love at frst sight. Mind you, I was still fshing from that old gorgeous stretch of beach, and the place is meticulously maintained. But if you crappy scuba yak. The PA 12 is the fshing machine I had dreamed up in my mind ever want to flm an Armageddon movie where all human life has disappeared, and I stared at it for a full two minutes. I wanted one bad. Now fast forward again to April 2013, Port St. Joe, and I fnally have the chance to road test the kayak I've coveted for almost two years. I arrived on a Tuesday afternoon and met my roommates for the next three days: Ric Burnley and Paul I'm not saying I predicted the current kayak angling revolution, but I knew we were onto something big. this is the place. Fortunately, the rental market is strong and folks are discovering WindMark as a high-end, practically private getaway. Or, for our crowd, a perfect spot for a corporate press junket. The big house became our central headquarters for telling outlandish stories, imbibing and home cooking. We even sampled Southern staples like hushpuppies and cheese grits. Ingrid "Hot Mama" Neihaus, who I'd frst met Lebowitz. 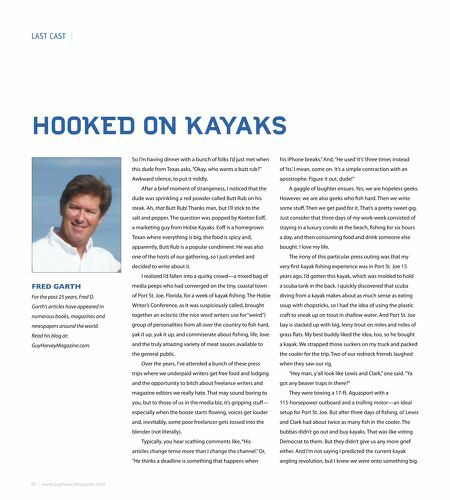 Ric is the editor of Kayak Angler magazine, and it turns out that Paul is in Vegas in 2011, kept pumping out meals and keeping fnicky writers happy. 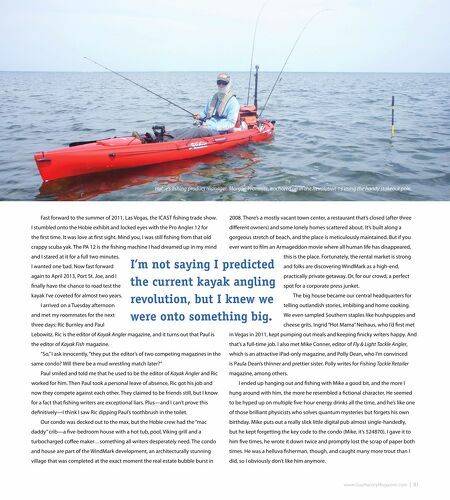 And the editor of Kayak Fish magazine. that's a full-time job. I also met Mike Conner, editor of Fly & Light Tackle Angler, "So," I ask innocently, "they put the editor's of two competing magazines in the same condo? Will there be a mud wrestling match later?" Paul smiled and told me that he used to be the editor of Kayak Angler and Ric worked for him. Then Paul took a personal leave of absence, Ric got his job and which is an attractive iPad-only magazine, and Polly Dean, who I'm convinced is Paula Dean's thinner and prettier sister. Polly writes for Fishing Tackle Retailer magazine, among others. I ended up hanging out and fshing with Mike a good bit, and the more I now they compete against each other. They claimed to be friends still, but I know hung around with him, the more he resembled a fctional character. He seemed for a fact that fshing writers are exceptional liars. Plus—and I can't prove this to be hyped up on multiple fve-hour energy drinks all the time, and he's like one defnitively—I think I saw Ric dipping Paul's toothbrush in the toilet. of those brilliant physicists who solves quantum mysteries but forgets his own Our condo was decked out to the max, but the Hobie crew had the "mac birthday. Mike puts out a really slick little digital pub almost single-handedly, daddy" crib—a fve-bedroom house with a hot tub, pool, Viking grill and a but he kept forgetting the key code to the condo (Mike, it's 524870). I gave it to turbocharged cofee maker…something all writers desperately need. The condo him fve times, he wrote it down twice and promptly lost the scrap of paper both and house are part of the WindMark development, an architecturally stunning times. He was a helluva fsherman, though, and caught many more trout than I village that was completed at the exact moment the real estate bubble burst in did, so I obviously don't like him anymore.